THE ROMAN ACTOR. A TRAGÆDIE. As it hath diuers times beene, with good allowance Acted, at the private Play-house in the Black-Friers, by the Kings Majesties Servants. LONDON. Printed by B. A. and T. F. for ROBERT ALLOT, and are to be sold at his Shop at the signe of the Beare in Pauls Church-yard. 1629. 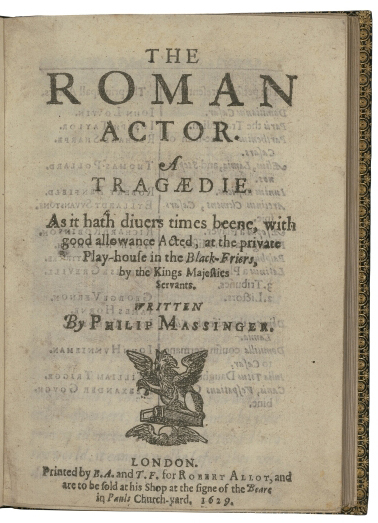 Folger STC 17642 copy 1. Image not from the transcribed copy.